It’s gonna be tough to top 2015 for me, having had the honour to compete internationally for Ireland with Kettlebell Girevoy sport and bringing back European and World Gold medals to Waterford. This year though I plan to do something with all that hiking training I’ve done and continue to do up to Coumshingaun in the beautiful Comeragh Mountains. This year I’m going to take on the challenge of a lifetime and climb Kilimanjaro with my wife Nicola Foley and our fab friend Emer Croke in a charity trek in aid of Diabetes Ireland. The two girls were planning to do this already to mark their 40th Birthday but when a good friend of mine (Liz Murphy) came to me and asked me to do the climb for the Diabetes Ireland charity, I thought to myself, “why don’t we all do it for charity?” It was an excellent idea from Liz and very personal to us as Nicola’s mother and father have type 2 diabetes, Emer’s mother in law also has type 2 diabetes and so does my lovely Nana who has only turned 93 in December. My friend Liz is herself a Type I diabetic, which is a lot more serious as you’re born with it. Liz, is like the fourth member of the team and cannot take part in the trek herself but will be helping us to hit her funding targets. Aside: Diabetes is a medical condition whereby the insulin created by your pancreas is not sufficient to deal with the amount of sugar in your blood. Some diabetics must inject with insulin to help deal with high blood sugar levels, some must manage their sugar levels through diet. A diabetics blood sugar levels can also drop very low, which can be very serious and they must eat/drink something really sweet like lucozade to deal with this or it could result in loss of consciousness. This is my understanding of the condition. It is my opinion that people without diabetes should also be conscious of condition and their blood sugar levels also and keep an eye on consumption of starchy carbohydrates and refined sugars in order to prevent onset of type 2 diabetes and other health conditions such as obesity. So we did some research and decided to do it and we made our initial donation of €750 and now we have to raise €14,250 in for Diabetes Ireland in order to take part in September. We will be doing trojan work organising events over the year and will be donating as much as we can personally also in order to assist hitting our targets. Between this and our deposit we have already raised over 2000 towards the trek in a few short weeks. To get to our first 1000 in online donations I got my chest waxed which can be seen on our charity trek facebook page if you are not too squeamish LOL. We have a number of fantastic events lined up in order to raise funds for Diabetes Ireland. On the 1st of March we will be holding a Big Trek Quiz Night in Revolution Waterford. Doors will open at 8pm and Quiz starts at 8.30. We will have prize for winning team and a raffle on the night also with some great prizes. 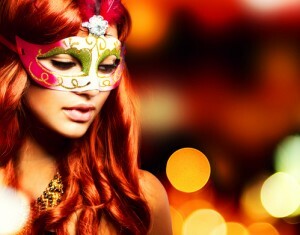 Our main event will be our fabulous Charity Masquerade Ball, which is happening in the Athenaeum House on the 2nd of April. The schedule of the night includes, prosecco reception & photobooth, 5 course meal, live band Rubber Soul, balloon raffle, masks off, and DJ till late. 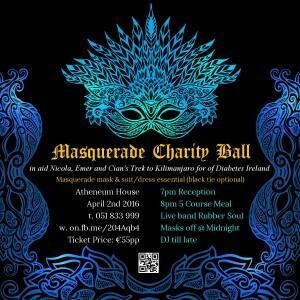 The tickets (designed and printed by UTD Web Design, shameless plug) are available now from Athenaeum house at 051 833 999. With approximately 80 tickets sold already and only 130 capacity it’s important to book early to avoid disappointment (these tickets would make a nice Valentines day gift… hint hint lads!). Click here to find out about our fantastic competition to win 2xTickets to the ball and an overnight stay with brekkie for 2 at the luxurious Athenauem house, worth house €200!!! We hope to have a Charity Rock Concert night too featuring the legendary 80s Hair Rock band Sleeze n’ Cheeze a few weeks after the charity ball. Venue and Date TBC. After this we will be having a race night on 20th of May (venue TBC) to hopefully really bring us towards our final target and then we can prepare for the trip mentally and physically. We hope to do some bag packing or collection day in supermarket so if anyone can help us out there we would appreciate it. You can contact me personally at ciandfoley@gmail.com if you wish to help us out. We will be doing a lot of training locally, but we cannot prepare for the altitude. The local mountain range we will be preparing on is just over 2000ft to the highest point, Kilimanjaro is over 19000ft, so it is 10 times the height of the back cliff of Coumshingaun. When we get to about 10,000ft we will really begin to feel heavy footed so it’s important that we are as fit and light as possible by the time we get there. Thanks a million for taking the time to read this blog. We’re delighted to be raising funds for this very good cause and we can’t wait to take part in the challenge. This entry was posted in For Charity on January 27, 2016 by Cian Foley.